It's really grainy, and you can't make out the famous E=MC2 equation, but this is the only known photograph of the master hammering away at the chalkboard on his special relativity formula. David Topper and Dwight Vincent of the University of Winnipeg discovered the photograph in a halftone newspaper file photo clipping. 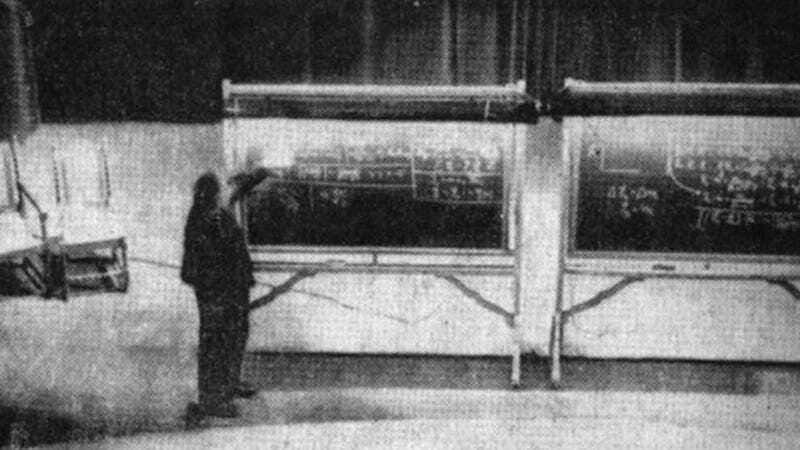 It features Einstein using two blackboards to express the derivation of the equivalence of mass and energy during a public lecture in Pittsburgh in 1934. In the end there were several missed opportunities and failed comprehensions that day— surely by the photographers, some from the audience, and perhaps even by Einstein himself. Because he was posed next to the wrong blackboard, no photographer snapped the picture posterity wanted; that is, capturing the famous scientist with his equally famous energy equation. Yet we know that even if he had been placed next to the correct blackboard, few viewers then, as now would immediately grasp the signiﬁcance of [E=MC2]. How many in the general public know the convention of setting c=1? Moreover, this issue is a subset of a larger one of Einstein’s own making; namely, his decision to overlook the nonmathematicians in the crowd, and instead to pitch his talk consistently at a high mathematical and abstract level. Probably no one expected Einstein to dumb-down his talk; after all, he was delivering the Gibbs Lecture at the request of the AMS. Read the entire paper: "Einstein’s 1934 two-blackboard derivation of energy-mass equivalence" (2007).